An Elegant Limestone Fireplace Installation in Grayshott, Surrey. Limestone Fireplace Surround in Grayshott, Surrey. This Limestone fireplace installation was a really enjoyable project. We worked for some very charming clients who knew exactly what they wanted. Our brief was to remove the original fireplace which was a gas ‘hole in the wall’ fireplace. After the removal, our next task was to open up the chamber and then re-plaster the whole of the chimney breast. Finally, we installed a beautiful, elegant limestone fireplace surround and included slate slips and a slate hearth for the new solid fuel fire. 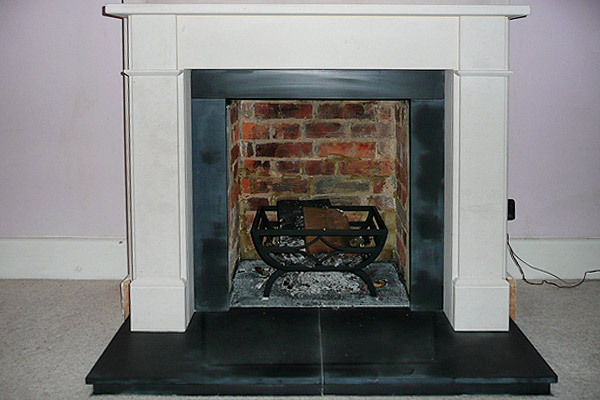 View another Limestone fireplace installation we installed in a property in London.